The view of Lake Okanagan from a room at the Sparkling Hill Resort, just southwest of Vernon. Only steps away from SilverStar village, I duck into towering white spires of hemlock and spruce. Growing in that pointed, perfect, mountain way, their radical tapering at this altitude is an adaptation to shed snow and rain directly to the roots; life is tough in the alpine, and organisms command every advantage they can. Biology aside, moving among these “snow trees” is sublime, clad as they are in the sound-absorbing splendour of yet another snowfall. They are sentinel, solace and sanctuary on the winter landscape. 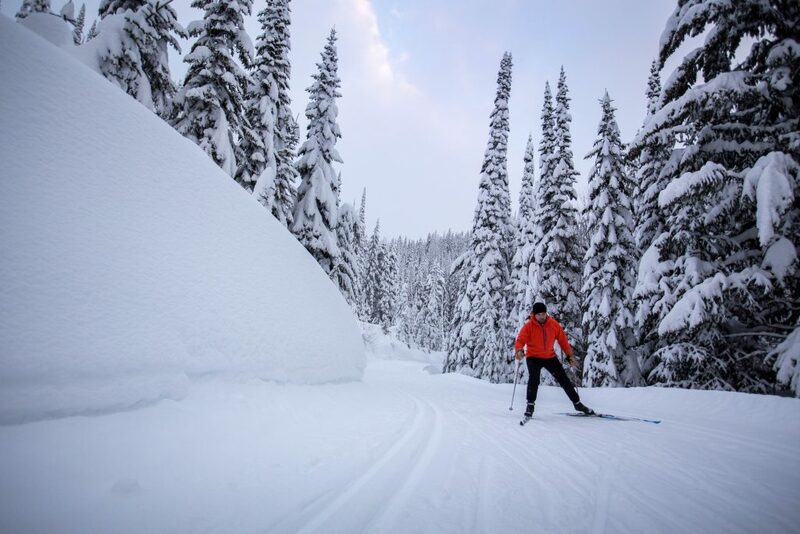 These snow trees are a hallmark of SilverStar Mountain Resort in British Columbia’s Thompson Okanagan region, and you can experience them on a range of trails in various ways, including fat biking and cross-country or downhill skiing. But for this short evening jaunt, minutes after checking into the Snowbird Lodge, I’ve chosen snowshoes. In the forest, snowshoeing delivers a slow-motion appreciation and intimacy that the speed of skis can blur. You see the myriad animal tracks criss-crossing unbroken snow, the tiny birds dashing between snowy skirts, the moss-sicles swinging on pine-scented zephyrs. Snow here is light and fluffy, meted out in tolerable doses, something a coast-dweller like myself — used to massive, heavy dumps fresh off the Pacific — can appreciate. In this Interior snowbelt, winter starts early and is refreshed frequently with moderate amounts; the trees get flocked, then flocked again. Eventually, in a good winter such as this, they become gelid cones, anchored to the snowpack. As I wend my way through, a breaking storm releases a molten sunset to the west, flushing the treetops amber and salmon as gunmetal gathers between them. Considering it’s only my first hour of a four-day ski and wine tour in the North Okanagan, nature has done an exceptional job at arranging something worth toasting. 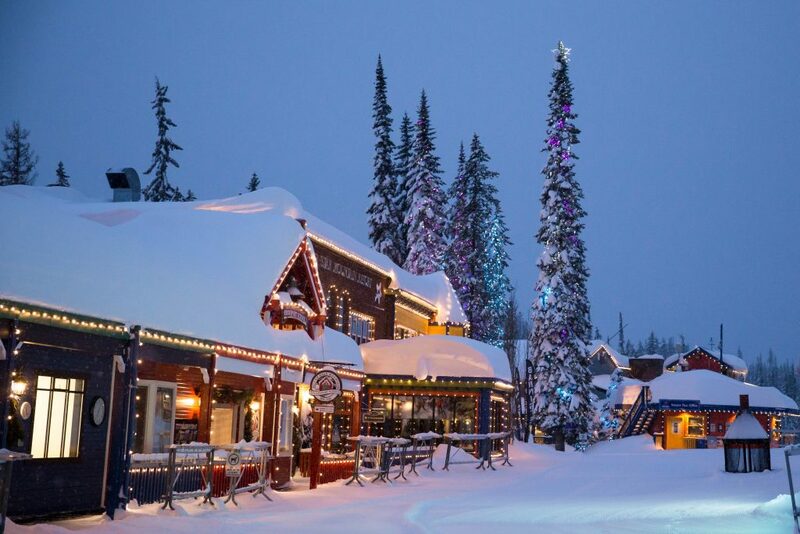 Lights cast an early-morning glow over the snowbound village at SilverStar Mountain Resort. A cross-country skier glides along one of SilverStar’s groomed trails. Located less than an hour from Kelowna International Airport, SilverStar is one of British Columbia’s largest ski areas, with 1,300 hectares of terrain, a 760-metre vertical drop and annual snowfall of more than 700 centimetres. 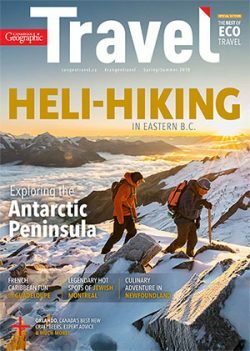 Lauded as intimate and colourful, the unique mid-mountain base and slopeside accommodations are a vibrant concatenation of amenities, from ice rink, tube park and a kids’ snowmobile track, to the aforementioned snowshoe, fat bike and cross-country trails. The impression is of more to do than you could ever have time for. Especially if, as I am, you’re mostly here to ski. My haste on that front increases when morning brings another 16 centimetres of fresh snow. After a quick croissant and coffee at Bugaboos Bakery Café, I click into my skis outside its door and glide down to the Comet Six Pack Express chair just as it opens. Powder is everywhere on the frontside Vance Creek area, yet people are not. In fact, I see more of them out for a morning cross-country skate than jumping onto lifts to enjoy untracked bliss. Keeping ahead of the crowd, I head to Putnam Creek, a steep and genuinely deep backside black-diamond playground where powder streams up the front of my jacket to occasionally plug my unconscious grin. Seeking a bit of respite after several thigh-burning runs, I duck into Paradise Camp, SilverStar’s only on-mountain restaurant, located at the intersection of its alpine network and the 105 kilometres of groomed-daily Nordic trails it shares with its famous neighbour, Sovereign Lake Nordic Centre. Despite being so far back in the resort, Paradise is open for breakfast, lunch and dinner (by snowcat), and comprises a great meeting point — especially if part of your family wants to ski cross-country while others ski alpine. Experiencing a new mountain in the best possible conditions is what skiers live for, and for the next couple hours I range across Putnam’s ridges and gullies, plumbing snow-tree glade after snow-tree glade. Back on the front side, I enjoy a signature elk burger at The Red Antler, whose elevated pub offerings include the mountain’s largest beer selection. Dinner that evening is at Silver Grill, an intimate, panelled enclave that floats above a jigsaw of restaurants in the same building, including the Den Bar and Bistro, a ski-in/ski-out hangout that regularly features live music. The food at Silver Grill is top grade, the British Columbia wine its match, and windows fronting the single, cosy room look out onto a raging snowfall the entire evening. Tomorrow, SilverStar skiers will dine again on ethereal powder, while I depart to sample the North Okanagan’s earthier oenological charms. Copper stills and fermenters at the Okanagan Spirits Craft Distillery in Vernon. Among the distillery’s offerings are Canada’s first fruit-based absinthe, plus vodka, whisky and a caraway-flavoured aquavit. 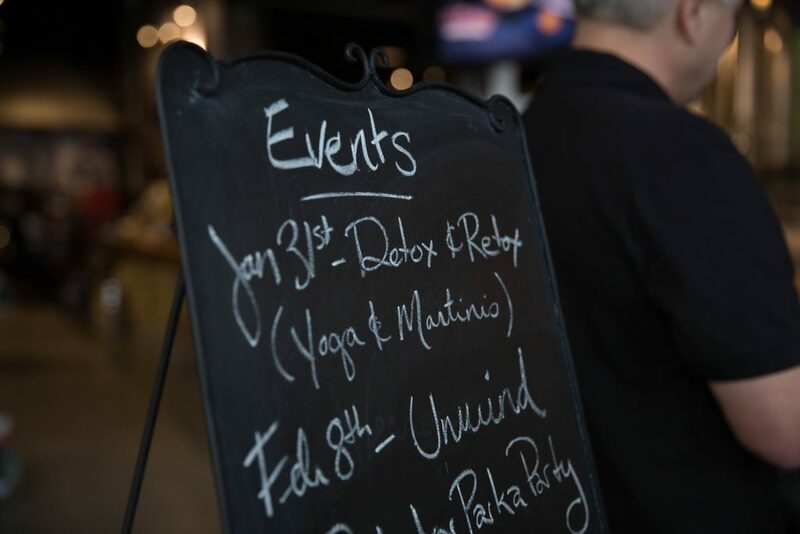 A sign at the Okanagan Spirits Craft Distillery advertises a “yoga and martinis” event. The link between these two seeming solitudes is the town of Vernon, a mere 20-minute drive from SilverStar. Circled by rolling hillsides, snowy parks and sizable lakes, Vernon has outgrown its role as a utilitarian hub for agriculture, forestry and mining to become a staging ground for fun and adventure, food and wine, skiing and spas. “We know we’re not pretty, but we’re full of surprises,” a citizen puts it to me. I’m not sure I’m onside with the former as I embark on a walking tour with historian and storyteller Gabriel Newman, who traces the area’s history and iconic characters, aided by dozens of wall murals that deliver the town of both humble charm and an unmatched urban aesthetic. As it happens, the 58th Vernon Winter Carnival is underway, with the usual panoply of local arts, culture and sport events. When I chat up a young guy in a hot-air balloon basket inflating his rig, he relates how growing up here he was fixated by the town’s long-standing carnival ballooning event. When I ask whether this instilled in him a desire to fly, he says not really, he’s just into balloons. Though Vernon’s main drag features any number of innovative new restaurants, I aim for the Naked Pig Barbecue & Smokehouse, which specializes in low-and-slow, artisan-style smoked cooking. Leveraging its sister relationship with neighbouring Marten Brewing Co., the airy bistro also features German-style craft beers that pair perfectly with brisket, pulled pork and ribs. 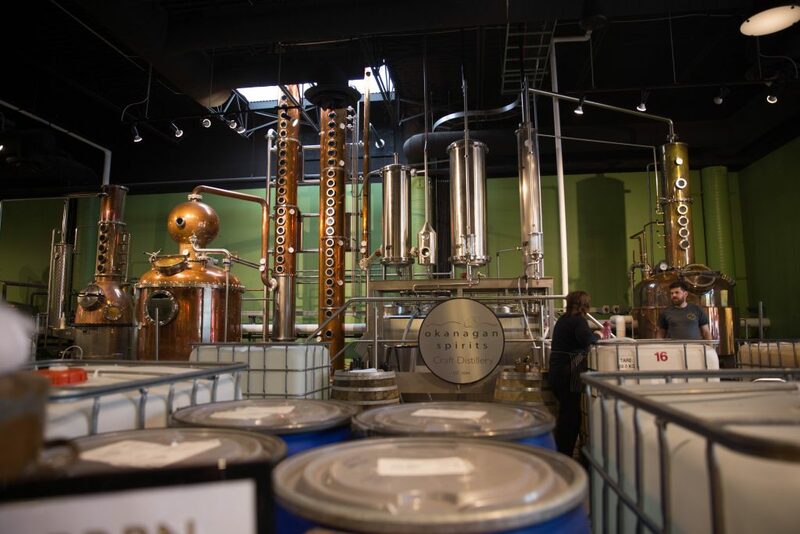 After lunch, I follow a recommendation to stop in for a tasting at Okanagan Spirits Craft Distillery, whose diverse portfolio spans vodka, gin brandies, fruit liqueurs and Canada’s first genuine fruit-based absinthe. A single malt whisky produced once a year in small batches using British Columbia malted barley is good, but the winners for me are the Scandinavian-style aquavit (caraway is the dominant flavour) and absinthe. Diluting the latter with ice water to cut the 60 per cent alcohol content has the welcome effect of also making it go milky and aromatic. With a driver on hand, I perhaps sample more than I normally might, knowing I have a healthful place to recover before tomorrow’s wine tour. At the Garden Bistro at The Chase Wines, vegan snacks are paired with wines. Pictured is a wine poached pear with raspberry purée and purple daikon radish. 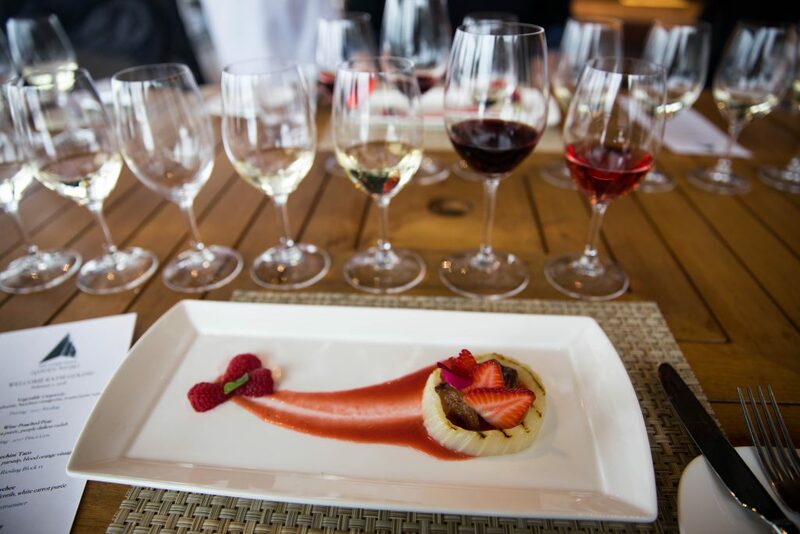 If you need a base for a wine junket in the Okanagan, it’s hard to do better than Sparkling Hill Resort, the province’s premier international destination for wellness travel. Set high on a bench above Okanagan Lake, the 3,600 square-metre KurSpa built by the Austrian Swarovski crystal company is the embodiment of European-inspired health, wellness and inexplicable architecture. Its crystal-draped atrium leads into a spa area of seven unique steam and saunas, four experiential showers, a Kneipp walkway (alternating hot-cold immersion for the lower limbs), outdoor infinity pool, hot pool, saltwater pool, serenity room, tea room, fitness studio and wellness clinic offering a range of treatments. As I cycle through the relaxing offerings of this futuristic facility, it feels like walking through a spa on another planet — or a hologram on the starship USS Enterprise. I almost expect the robed clientele I pass to speak Klingon. After a Euro-style buffet breakfast the next morning, I spend more time exploring the spa before heading out to visit a few wineries along Okanagan Lake’s “Scenic Sip” wine trail. First up, The Chase Wines, opened in June 2016 by winemaker Adrian Baker, a Kiwi with a knack for aromatic whites. In its Garden Bistro, I join a group for an amazing display of ad hoc cookery; given today’s demanding mix of dietary restrictions, the young chef is experimenting with a seven-course vegan feast — incredibly difficult when it comes to wine pairings (which turn on fats and strong flavours) — but he pulls it off with panache, linking delicious dishes and brilliant presentations with Riesling, Gewürztraminer, rosé and chardonnay. Later, I’ll find Intrigue Wines light on the palate but accessible in price while Ex Nihilo (“out of nothing”) is the eponymous theme of a winery that offers big, bold reds and daring whites, the latter an area tradition pioneered by the place I finish up at. George and Trudy Heiss’s Gray Monk Estate Winery has blazed the trail for winemaking in the Okanagan since 1972. With two generations working the vineyards, the legacy continues, an entire wall of their tasting facility scaled with the annual awards for their signature pinot gris. My informative tour ends in a “wine library” where reference bottles of everything produced here are archived. Scanning these historic and intriguing labels is denouement to a long day. 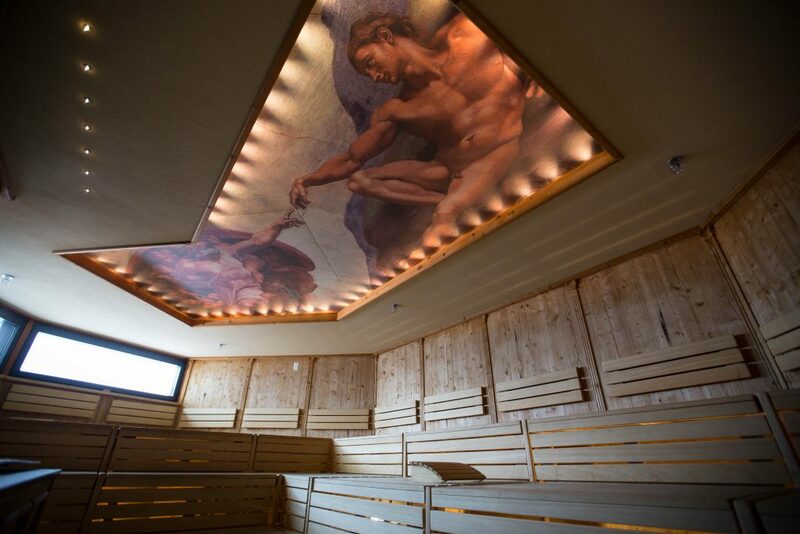 A copy of Michelangelo’s The Creation of Adam adorns the ceiling in a sauna room at Sparkling Hill Resort and Spa. Back at Sparkling Hill, I ease into the outdoor infinity pool for a night-time dip. The day’s grey skies have finally cleared and I imagine skiers at SilverStar looking forward to a sunny day. Gazing into the night, moonlight appears to pool like quicksilver on distant mountaintops. It’s an odd effect that doesn’t make sense until I recognize why: it’s those snow trees again, hogging all the alpine glory in a farewell salute.